This is nautical letter "X" or "X-ray". 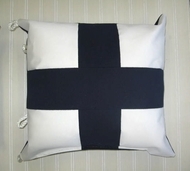 Our nautical code flag pillows are made exclusively for us. This pillow measures 18x18 or 22x22. You can also order them in other sizes, please feel free to call us if you are interested in a different size.